As we have been reporting, many reforms to the Social Security Disability Insurance (SSDI) program could improve its effectiveness, fairness, and sustainability. One potential area for improvement is program integrity. The Office of the Inspector General (OIG) recently published a report on preventing and detecting fraud in the Social Security Disability Insurance (SSDI) system. The report summarizes existing recommendations to reduce fraud in light of recent cases in New York, Puerto Rico, and West Virginia. Over the past decade, the number of SSDI applications, awards, and beneficiaries has increased substantially as baby boomers have reached an age range with a higher probability of disability. Benefit payments have increased, but revenue coming into the system has not. As a result, the Disability Insurance Trust Fund is projected to run out of funds in late 2016. Find fraud before it happens, rather than after benefits are paid. Predictive data analytic systems, used by private disability insurance companies, identify warning signs or patterns, screen applications for risk factors in real-time, and detect fraud before it occurs. SSA is currently testing different predictive analytics systems to improve its fraud detection capabilities. Increase the use of dedicated fraud detection teams. Fraud Prevention Units (FPUs) of disability examiners review and identify suspicious disability claims (flagged by data analytics) and, when requested, support OIG during fraud investigations. In 2014, SSA established the first three FPUs in New York, Kansas City, and San Francisco. Increase data matching. SSA largely stores claims as scanned forms, which are not searchable. A comprehensive data profiling system would allow SSA to track and compare information on medical providers, claimant representatives, or agency employees. This will help SSA detect if certain claimant representatives or attorneys have higher allowance rates, if several claims allege exactly the same medical condition, are approved by the same physician, or contain equal information. Strengthen online authentication to prevent fraud through the online portal. Update medical and occupational guidelines, which is some cases have not been changed for decades, to reflect advances in medicine and technology. Treatments for certain medical conditions have substantially improved the patients’ quality of life and many non-physically exerting jobs have become more suitable for people with disabilities. SSA is currently looking at improvements so that it can better factor in age, education, and work history into the initial eligibility determination process. Use social media to verify applicants’ claims during reviews. During criminal investigations, OIG has sometimes gathered evidence of beneficiaries engaging in extreme physical activities while claiming SSDI benefits. Identify appeals judges who are outliers. OIG has found a wide variation in the percent of cases approved by judges, ranging from 8.6 to 99.37 percent. A better data analytics system will allow SSA to understand which factors affect the allowance rate and take remedial action. For instance, a particular judge in Huntington, West Virginia was alleged to conspire with an attorney representing claimants to approve benefits for those who would have normally been ineligible. Improve oversight of Administrative Law Judges by ranking their performance using multiple risk factors, rather than just one. Allocate resources to clear the Continuing Disability Review (CDR) backlog. SSA conducts periodical reviews to ensure that claimants still meet the criteria to receive benefits. 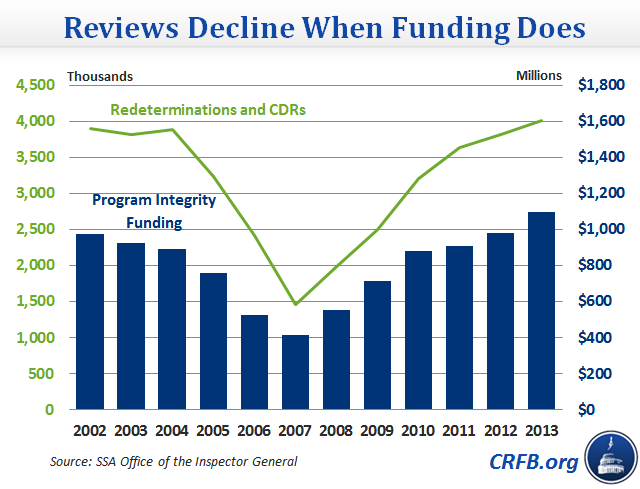 While these reviews have high returns, yielding $9 in savings to SSA programs for every dollar invested, funding for these reviews dropped from 2002 to 2008 and no dedicated funding was provided from 2004 to 2008. Not surprising, less funding led to a drop in the number of CDRs performed and a large backlog (1.3 million overdue medical CDRs in 2013). SSA estimates that $11.8 billion in funding over the next 10 years would eliminate the medical CDR backlog by FY 2018 – these costs, however, are above the amounts dedicated for these reviews in the Budget Control Act of 2011. Reconsider the rule for determining when to terminate benefits. The current standard requires that SSA find a medical improvement before ceasing benefit payments to a claimant. This makes it difficult for SSA to reverse decisions where the initial decision was not well documented or fully supported by the evidence on file. In these cases, it may be hard to prove that the condition has not changed. Better staff training may help alleviate this problem. End payments to beneficiaries after medical improvement. In some cases, SSA has continued paying benefits for months or years after a CDR determines that a person has improved and should no longer receive benefits. Using an automated system to enforce terminations after a proven medical improvement could help fix this problem. Perform work-related CDRs when SSA has an indication that a beneficiary is working and earning above the eligibility threshold (known as Substantial Gainful Activity, or SGA). OIG estimated that about $1 billon in overpayments went to approximately 119,500 claimants that did not meet the work criteria. Although fraud is estimated to account for only a small part of SSDI benefit payments, policymakers would be wise to look at this issue carefully to make the program more efficient and boost public confidence in the system. In fact, this is one of the objectives of the recently launched McCrery-Pomeroy SSDI Solutions Initiative, along with other ideas to improve SSDI's determinations process, eligibility criteria, coordination with other related programs, and work incentives.